the Dirty Vegan: Mango Gelato Madness! Did you ever see those cute displays at specialty supermarkets, cafes, and so many other places? 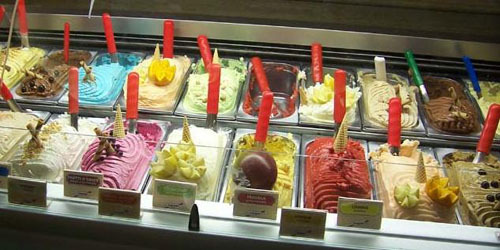 Super creamy gelato in delectable flavors; its like madness! And did you ever stop rather than the usual strolling on by, and ask if any flavors were vegan-friendly? I did before, because they almost look like they should have a vegan option, don't they? At least a fruity one, right? Unfortunately, most gelatos contain egg whites and/or dairy. Never fear Dirty Vegans, I have created an awesome gelato recipe for you that is vegan and oh-so easy! Enjoy! Place all ingredients in blender/ food processor (I used a Cooks pulse blender - like the Magic Bullet - to make mine and it turned out great). Blend until smooth and creamy. Add more mango if you would like a thicker consistency, or use less or more almond milk to control the consistency. Enjoy your gelato!